Students everywhere will be taking the PSATs and SATs. The PSAT, which occurs in the fall, is a preparatory test for the SAT. The SAT (or another test—the ACT) is required by most colleges as part of the application process. There are some important changes this year on the PSAT and SAT that have implications for how to prepare to take them. The changes are in effect now on the new PSAT for 8th and 9th graders as well as the PSAT that 10th and 11th graders take, and begin in the spring on the SAT. 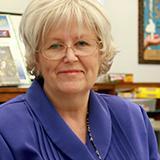 Two very positive changes affect the scores students get. On the old tests, it was not advantageous to guess at answers if you really did not know the answer. A wrong answer was penalized, so if you missed it you would lose points from the ones you got correct. Now, an incorrect answer doesn’t hurt you. You simply do not get the point for that question. Students should take a stab at every question, even if they do not know the answer. In addition, the multiple choice questions have four choices now instead of five! That means there is a greater chance of guessing correctly. The math part of the PSAT and SAT tests changed considerably. There are a few trigonometry questions that were not asked on the old PSAT and SAT and fewer geometry questions than before. The biggest change, however, is that there are two parts of the math section. You are allowed to use a calculator in one, and you cannot use a calculator in the other. This change—not being allowed to use a calculator—may affect some students more than others. Our upper-level math teachers frequently report to me that their students do not remember all of the basic math facts. If your child frequently uses a calculator in algebra or another higher level math class, find out whether he is relying on it for simple facts (like 8 x 9, or 56/8). If so, he will have a lot of trouble on the PSAT or SAT when he is not allowed to use a calculator. There are many apps available for drilling math facts. He should spend 10 or 15 minutes every day drilling until they are automatic. It will help him in math class as well as when taking these tests. To learn more specific information about the PSATs and SATs, go to the ETS website. There are practice tests available there and tips for how to prepare for the tests. It is a good idea to also check out the ACT. Most colleges will accept either test, and students may submit their best score. The tests are very different, and some do better on one over the other. A final thought—students may take these tests more than once. The first time can be a learning experience to prepare for the next time! 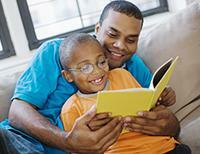 There are many simple things you can do to help your child quickly learn the basic elements of reading. When starting the reading process, a very young child may look at a group of words in a sentence or a paragraph, and see just that, a group of words! Children need to understand that in trying to determine what these words mean (when reading English and most languages), they must always start at the left. If there are several sentences to read, they must always start at the top left. If your child has difficulty with the concept of “left,” here is an exercise that can help. Have her hold up and fully open her left hand with her palm facing outward, towards you. She will see the back of her hand. Ask her to make a letter “l” with her hand, and tell her this “l” stands for “left.” Children love this learning aid because they always have it with them! A good way to reinforce this “start on the left” concept is to always move your index finger in a left-to-right sweep when you are reading to your young child. This will help her in recognizing words and in understanding the importance of left-to-right progression. Once your child is older and starting to read on his own, have him hold a small index card below the sentence line he is reading to you. This will focus his eyes and his attention on the sentence he is reading, not the one above or below. When reading together, ask her questions about the words. For example, ask her to point to the word in the first sentence that says “dog.” You will probably be pleasantly surprised at how fast she can identify common words found in many early childhood books. As she learns more words, she will see how they make perfect sense when read in left-to-right progression. Parents often push their children to take honors and AP level classes because they want them to be challenged and have a better chance to get into a competitive college. Additionally, they want them involved in extra-curricular activities so they have little free time to get into mischief. For some kids, I agree this is appropriate. For all kids, though, it is important to take a look at their overall schedule to make sure it is reasonable. Students in middle and high school need to have some “down time” in their life, and scheduling too many difficult classes and extra-curricular activities is not healthy for them. How do you know if your child is overscheduled? If your daughter routinely stays up past midnight to complete her homework, she may be trying to do too much. The National Sleep Foundation recommends that teens get from eight to ten hours of sleep each night. I frequently ask my students how much sleep they get, and most report they only get five or six hours on school nights. They get home from sports or band practice, eat dinner, start their homework, and do not get finished until very late. There are many negative effects of not getting enough sleep, some of which relate to poor performance in school. Frequently staying home from school is another sign that your child may be overbooked. The stress your son feels from not having any fun time and not getting enough rest, often results in exhaustion and illness. Then, missing school adds to the stress because he has so much work to do to catch up after being out. Overbooked teens often become anxious. Your daughter may worry about just about everything—pleasing her parents, doing well in school, not letting her teammates down, not having enough friends. She may ask to drop a class from her schedule, which might not be a bad idea. She may need guidance in deciding what she should drop, however. (She may not be thinking logically while anxious.) If your daughter feels anxious about school and life, it is time to take a look at her overall schedule. Consider allowing her to switch some of her classes from honors to regular level or perhaps dropping something from her schedule. Taking too many upper-level classes and participating in too many extracurricular activities is risky for teenagers. Examine whether your child is getting enough sleep at night and attending school regularly. Note whether he feels anxious a lot. Make sure there is time for him to enjoy being with friends and family, attend social events, and have some time when he does not have to do anything at all. He needs to have some fun to stay healthy and happy. Although much of my professional focus is now on enhancing literacy skills, my blog posts will never neglect the importance of starting young students with solid math skills, as well. Last week I wrote about the importance of “one-to-one correspondence” in reading. One-to-one correspondence is very important to early math also. Basically, this concept means correctly matching numbers to objects. Rote number counting, and knowing what that number represents, are two very different and distinct mathematical skills. A student can be an excellent counter, yet not be able to identify a random number out of numerical sequence. Or your child may be able to say the numeral 9, yet be unable to count-out nine objects. In a dish, place a small amount of a favorite snack like Cheerios, raisins, Goldfish crackers, etc. Start a “roll for snacks” game by rolling a single die, and have your child counts the dots. He can then count out and save an equal number of pieces from the snack dish. (Who knew that counting could be so yummy?) To increase the difficulty, use a pair of dice, and add the dots before counting the total. If the snacks build up, they can be saved and enjoyed later on. From a deck of playing cards, remove 10 “number cards” (2-10) from the same suit. Let the “Ace” from that suit represent the number 1. Line up the cards from left-to-right, the Ace to ten. Below the cards, have her place the correct number of pennies shown on the card. Once she can easily do this from one to 10, mix up the cards and place them out of sequence. Practice this until she can match the pennies to the individual numbers shown on the cards, no matter what the sequence. Put a pile of 20 pennies on a table. Say a number out loud between 1 and 20. See if your child can count out the number of pennies that you said. If he can’t do it by himself, help him count out the correct amount. Have him put the pennies in a straight line, pointing to each penny, as he counts in sequence. Practicing math one-to-one correspondence, while having a little fun, will help your child make the connection between seeing, saying, and knowing. There is a difference between being intelligent and doing well in school. Generally, people speak as if the two are the same. In fact, there are some very smart people who do not do well in school and some who might not seem as “smart” but who do very well. We should not say, “She’s so smart. She gets all A’s in school,” because it is likely that she gets great grades because she works very hard at it rather than totally because of her intelligence. I have taught some extremely intelligent students who did not do well in school. I have taught some who others felt were not as smart, who did great! It is hard to define intelligence. Some say it is the ability to acquire and use new knowledge. Others say it is the ability to solve problems. Skill is defined as the ability to do a particular thing. The ability to read is a skill. The ability to drive a car is a skill. Most of the time, an individual person will not acquire all skills at the same rate, and this is likely related to facets of their intelligence. An elite dancer may have an innate intelligence that makes him able to dance in such a beautiful way. Another might be a fantastic mathematician with intelligence for logical and mathematical thinking (see Howard Gardner’s Theory of Multiple Intelligences). If a student is not doing well in school, it is important to tell them it does not mean he isn’t smart. I have heard students call themselves “dumb” when they clearly have talents in many areas other than reading, writing, math, and science. Many CEOs and entrepreneurs did not do well in school! Once they got out of school and became successful, they were considered brilliant. When your child tells you she is “dumb,” help her see that she has gifts that other children do not have. Help her understand that being smart and doing well in school are two very different things. There is more to life than going to school. One-to-one correspondence. In reading, it means that the child is verbally saying what he is seeing in print. Rhyming. This promotes phonemic awareness, which is a crucial prereading skill. Substitutions and deletions (for example, a child knowing that if you take away the c from the work "cake" and put a t in its place, the new word is "take." Or, if she knows the word "plate" and you delete the p, the remaining word is "late"). These skills are cumulative. A child cannot do step 5 if she is not proficient in the other four steps before it. Understanding this progression of phonemic awareness should help you assist your child in enhancing his reading development. The school where I work has a lovely ceremony each year when all students and teachers sign the Honor Code. Many teachers ask students to “pledge” their work, signifying that the work is their own. We teach students to cite their sources when they borrow the ideas of others. To sign a pledge that says—“I shall not lie, cheat, or steal, nor tolerate others who do”—seems cut and dried. In reality, it is complex. Interpreting individual cases can be difficult. There are times when parents should help their children figure out what is the right thing to do in a given situation. Your son may work with another student on homework. Teachers encourage students to help one another when they are having trouble figuring out how to answer a question. In most cases, this is fine. The difficult part is deciding how much working with a friend is OK, and at what point it is no longer your child’s work. There are some teachers who do not want students working together at all. These teachers feel that homework is the way to know which students have mastered the concepts. I would suggest that your son ask his teachers what their expectations are for homework. If there is confusion, he should err on the side of caution—he should do it alone. Another difficult area is when your daughter is writing a research paper. Changing one or two words in a paragraph from one of her sources does not make the work hers. Even changing whole sentences and paragraphs is not enough. She must give proper credit to the person whose ideas she is sharing. This is extremely hard for students to understand, and if your daughter makes a mistake she could be accused of plagiarizing, even though she feels she wrote it herself. It is probably a good idea to help her decide whether an idea needs to be cited, especially on the first few papers she writes. It is always better to over-cite than to not give credit when you should! There are times when students cheat and they know it. This usually stems from feeling desperate for one reason or another. Perhaps they are over-scheduled and simply did not have time to do an assignment. It is possible they do not know how to do the work and won’t ask for help (perhaps they’re embarrassed to ask). Maybe they are about to lose a privilege at home if their grades drop. For whatever reason, these cases are clearer and normally result in punishment. Even so, parents can help identify the reasons their child felt the need to cheat. It may be possible to adjust their schedule or arrange for tutoring support, if needed. All parents want their children to grow up to be honorable. The school’s honor code and how it is implemented can be helpful in teaching what it means to have integrity. Children make mistakes. When they do, take time to figure out what happened. Were they working with another student on homework and thought it was okay? Did they use another person’s ideas feeling they came up with them on their own? Or, did they cheat out of desperation? For whatever reason, take advantage of the situation to help your child learn how to do it better the next time. You may be interested in reading Honesty Is a Vital Part of Character for more on this important topic. Does Learning an Instrument Help Learning? It obviously resonated with folks as it generated a lot of “shares” and discussion, myself included. As a mom to a creative 6-year-old who loves to dance and sing, I’ve been thinking about music lessons and if/when we should introduce them. My own experience includes 10 years of violin lessons starting when I was 8. There were definitely times I’d have happily quit, but I’m so thankful I was forced encouraged to persevere. My musical ability is mediocre at best, but it opened the door to many opportunities over the years. And how awesome is it that now, as a parent, I can plunk out the tune to “Twinkle, Twinkle” on whatever plastic and tinny instrument is at hand. But does learning an instrument help learning? I was curious, so I did some googling and found these articles interesting. This video (just under 5 minutes) from Anita Collins is well worth a watch, as it shows exactly what’s happening in the brain as you listen to music and how that changes when you play music. I am going to encourage my oldest to think about playing an instrument but won’t push it too hard just yet. At the very least I’m hoping he doesn’t choose the violin as even now, 30 years later, I can recall the months of screeching that must be endured to learn the basics. Kindergarten and 1st grade are the critical times when a child is mastering handwriting. So much of good letter formation depends on your child’s fine motor development. Muscles in the hands and little fingers need to connect to their eyes and brains, developing and maturing eye-hand coordination. This is an activity I do often with my 1st graders. Standing next to your child, facing in the same direction, ask her to say a letter. Then, both raise your writing hand, index finger pointed out, and “print” the capital and lowercase letter in the air. When she can easily do this with letter partners, try simple words. Fill the top of a small gift-sized box halfway with sand or salt. With the index finger of his writing hand, have your child trace partner letters you vocalize. As he gets good with letters, practice simple words. Once he can easily trace letters and words with an index finger, use an unsharpened pencil. Using the unsharpened pencil allows him to “feel” how the word is formed when using a writing tool. “Talking out” the strokes of letters and words will give your child another way to remember how they are formed. For example, for capital h, help her say “straight line down, straight line down, bridge across the middle.” For capital or lowercase s, “sss” around and curve like a slithery snake. Children love these activities, as it gives them a chance to be successful printers before facing the challenge of writing on lined paper. If your child is a perfectionist, he may have trouble finishing his work in a timely manner. He may spend inordinate amounts of time trying to make each assignment or test question exactly right. He might feel that if he writes everything he knows about a question, he will get it correct. Usually, the extra effort does not pay off in better grades. In reality, the perfectionist who writes everything he knows often writes lower quality, disorganized answers. Even if the answers are well-written, there is more information given than is needed to answer the question. In some cases, he is not able to complete assignments within the time allowed, which also leads to lower grades. It is frustrating to feel you are working hard to produce excellent work, but it doesn’t receive the grade you are expecting. There are some strategies that may help. Learn what an excellent answer looks like. Your daughter needs to see an answer that is well-written, concise, and correct. You can ask her teacher to help with this. Her teacher can take the response she gave and highlight what she should keep, cross off what she should delete, and discuss what she needs to add (if anything) for it to get all the possible points. If possible, she can see how another student wrote much less but still got all the points for the question. By doing this, she will focus her answer on just three responses. She will choose the three she thinks are the most important and not get distracted writing about all six reasons that she actually knows. As she checks her work, she should count the three reasons and mentally connect them to the key words in the question. Make sure to use study strategies effectively. Students who want everything to be perfect can get stuck studying a few concepts until they can remember them perfectly. Your son may spend so much time worrying about them that he does not get to finish studying all the concepts he needs to study. The gaps in knowledge caused by ineffective study cause anxiety during a test because he knows he doesn’t have everything he needs in the answer. For more information about study strategies read, Teach Your Kids How To Study. There are times when being a perfectionist is a great asset. It becomes a problem, though, when it keeps you from finishing your work in a timely manner. Students who routinely do this can become anxious from worrying so much about the quality of the work and completing it on time. Learning how to answer questions correctly without over-writing, understanding how to connect key words in the question to the corresponding parts of the answer, and using study time more effectively can help reduce the amount of time spent on homework and when taking tests. This more effective use of time leads to less anxiety and better grades. Usually, during the first month or so of the school year, elementary schools schedule an open house or “meet the teachers” night. This is a very important event, and all parents should participate, if at all possible. It’s important because you will get to meet your child’s teacher, who will be a very influential person in your child’s life during this year. The teacher should provide you with an outline of the upcoming school year. You will learn what is expected of your child, and what is expected of you, to ensure success in the months ahead. You should be given examples of elementary grade-level “expectations.” These are educational fundamentals your child must master during the year ahead to be fully prepared to move on to the next grade level. How often should I meet with you during the school year? What is the homework policy for this grade? If we need to communicate, do you prefer email, written notes, or phone calls? What extra resources are available in this school if my child falls behind? What resources are available if my child advances well beyond his or her classmates? What is the most important thing we can do at home to make sure this school year is successful? Don’t confuse an open house with a private parent conference. 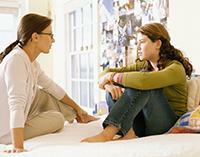 At an open house, teachers will not have time to discuss on your child’s specific issues. A separate private meeting should be scheduled if your child needs special attention early in the school year. An early school year open house can be an enjoyable and enlightening experience for parents. Since everyone wants the best for your child, this event is an important way to start the school year. Many schools have a rotating schedule, meaning only some classes meet each day. 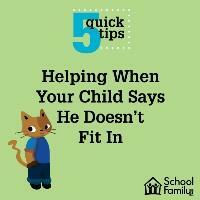 This can be very difficult for some students, especially those who are disorganized already. It becomes extremely important to figure out a system to keep up with the rotation of classes, know which classes are meeting the next day, and make sure all the work for those classes is completed on time. I recently asked several students about this to find out what systems they are using to help them. Anna said that she does the homework for her classes the day it is assigned regardless of whether the class will be meeting the next day. This is ideal for students who normally procrastinate or for those who find keeping up with what classes are meeting next is just too confusing! She carries her schedule (which she color-coded) in the front of her binder so she knows which class to go to next. She doesn’t really have to know before arriving to school, because she already did all the work! Marcus records in his calendar which classes are meeting each day. He is doing the homework the day before it is due, because he feels that it will be fresher on his mind. If he has a pop quiz, he will be ready to take it. This method does require some planning ahead, because he needs to check each afternoon before leaving school to make sure he takes home everything he will need to do his homework for the next day. A third student told me she is in a state of confusion and not dealing well with the rotating schedule. For a student like this, it might be a necessity to help her set up an electronic calendar. My Study Life offers a free calendar that is customizable for every school. It does take some time to set up, because you cannot set up the rotation of classes without first setting up the school year calendar. Once the calendar is entered, you need to enter what happens when there is an unexpected holiday or snow day—is that rotation lost, or does it roll forward? At our school, we lose the day and go on to the next rotation when we return. The app lets you know which classes are meeting each day as well as any tasks you have entered. If your child’s school is on a rotating schedule, it is important to help him figure out a system that will work for him. He needs to make sure to do the correct homework for each day. Whether he accomplishes that by doing it the day it is assigned (even when the class is not meeting the next day) or waiting until the night before it is due to do the work, he needs to consistently stay on track and keep up with all the work. If he’s having trouble, explore My Study Life to see if it can help. 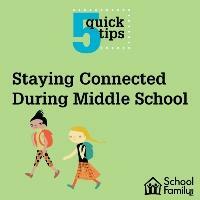 Staying involved in what is going on with your middle schooler is a tricky endeavor. She wants more freedom and you want to give it to her, but at the same time you don’t want to be completely cut off from her school life. But there’s no need to toss your hands up and assume it’s a lost cause. We have several ways for you to stay involved (without your child thinking you’re being a nag). Pack a backpack: Part of our morning routine is getting everyone’s bag packed with all the necessary gear for the day. I’ve found a small backpack for my little guy and created a spot for it in the front hall. When everyone else is packing up, we’ll ask him to put his snack and hat inside. He can carry it when we drop off his brother after, to wherever he’s spending the day (daycare, Grandma, Nana). Label stuff: I’ve never met a 2-year-old who doesn’t like stickers. It’s easy-peasy to get out the tape and markers and let him label his gear (and likely various pieces of furniture and body parts). Close the school day: My school kid is pretty proud of his “agenda” that has to be signed each night. It’s still early days (only about a week in), but he carefully places it on the counter when he gets home. Daycare is only part-time, but to include my younger son I think we’ll start keeping the slips of paper they fill out detailing what he ate and when he napped so he can put them with the agenda. Try a name change: Instead of “school” and “daycare,” we’ve started talking about “grade school” and “daycare school.” It seems almost too simplistic, but I tried it out this morning and my 2-year-old beamed. I’m thrilled with how easily my school kid started 1st grade, but I’m quickly realizing some of the time and attention I put on helping him transition would have been better spent preparing my preschooler. Hopefully these quick hit ideas will help him along now, and also encourage his own independence which can only help when it’s *finally* time for him to enter the schoolyard. Any other ideas or experience? I'd love to hear them. 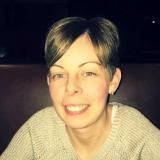 Kathryn Lagden is vice president, digital strategy at School Family Media, SchoolFamily.com's parent company. She lives in the greater Toronto area with her family. It is well-known that good readers make personal connections to stories. These self-to-text connections help children deepen their understanding of what is being read. Below are four concepts to help your child to relate to stories that he is listening to, or reading. Life experiences can help build your child’s prior knowledge for reading comprehension. For example, when you take your child to the beach, lake, zoo, park, or local farm, you increase her understanding of different settings in life. In education we call this building schema. Simply defined, schema is the database of life experiences. Encourage reading connected to family life. For example, if you have a family pet, read books together about dogs, cats, fish, etc. She’ll understand how owners take care of pets, and how pets add to family life. If he loves dinosaurs, generate opportunities to delve deeply into that fascinating subject. Get different dinosaur books from your local library. If possible, visit a museum with dinosaur displays. Get some small toy dinosaurs, and help him learn about the different types of dinosaurs and their characteristics. When children compare and contrast, they are simply thinking about how things are alike, and how they are different. Together you might read a fiction book, such as Clifford the Big Red Dog, by Norman Bridwell, and compare and contrast the story to a nonfiction book about a real dog. One non-fiction example I’ve read with my class is The Bravest Dog Ever, The True Story of Balto by Natalie Standiford. How are Clifford and the Balto alike? How are they different? Encourage your child to list at least three examples for each. Practicing these four simple enhancement steps will help your child become a good, comprehensive reader! Absences from school are unavoidable at times. Illnesses and family emergencies are not predictable. Some students find themselves getting anxious about how to get caught up when they return. After an extended absence, it does seem overwhelming. Every teacher thinks primarily about what the student missed in their class and may not think about the big picture—that the student has just as much work to make up in every class. I have found a table to be very helpful in this situation. Make a table with enough columns for every class your child is taking. Row one should list the classes and teacher’s names. The rows below are for listing the missing work and assignments from each class. Your child should take a printout of the table with her to meet with each of her teachers. Teachers can fill in the assignments with dates the teacher would like for each assignment to be complete. As the table is filled out by all teachers, it becomes evident that your child has a lot of work to do! When I have helped students make these charts, the normal reaction is a sigh of relief. Even though there is a lot of work to be done, having it all listed in one place makes it less scary. Your child can ask for extensions on deadlines, when needed. As long as teachers can see he is making progress, they are normally OK with relaxing the deadlines. It is also OK to ask a teacher whether there is something that he can be exempted from doing. Some teachers are helpful when they understand that the absence was for a necessary reason. Absences create stress in students because of how much work they miss while out. It is a good policy that children miss school only when necessary. Vacations should be planned on days when school is out. When absences cannot be avoided, using a table to help keep up with the makeup work can relieve some of the anxiety associated with having so much work to do all at once. We all want our kids to have friends and enjoy going to school every day. When that doesn’t happen, our hearts break and all we want to do is make things better for them. Before you do anything, take a moment and read these quick tips to help get you through this tough time. Help Your Daughter Deal With "Mean Girls"
As you well know, now that school is back in session, it’s a very busy time for families. One of the best things parents can do to help their child be successful in school is to become involved in the school community. Even if your time or resources are limited, there are many ways to be an active member of your child’s school. Join the school’s PTO or PTA. Even if you cannot regularly attend meetings, being a member keeps you current on school policies, events, and important information. Read everything that is sent home from the class. Mark important dates on your family’s calendar. Always make every effort to attend parent-teacher conferences. 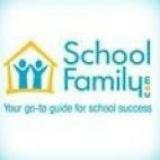 Become familiar with school policies, such as attendance, lunch protocols, discipline, etc. Ask questions if you don’t understand. Meet his teacher and principal. Get to know the makeup of the class. How many students are in the class and in the school? Does anyone have an allergy that you should be aware of when packing a lunch? How much homework to expect? And so on. Ask the teacher the best way to contact her. Does she prefer emails? Does she like a written note, as she might not see her emails until the end of the day? Ask for a short conference, if you have a particular issue you would like to discuss. Monitor homework. Let your child work in a quiet place, with few distractions. Have a special homework folder. In the lower grades, students need to have homework checked before putting it back in the folder and returned to school. If your child doesn’t understand the assignment, write a short note or email to her teacher explaining why homework was not completed. Volunteer to help if and when you can. You might not be available during school hours, but you may be able to attend evening meetings, sport events, or help the teacher put together a newsletter. Getting involved in school helps your child thrive and contributes to improving the overall quality of his education. Most important, your involvement sends the subtle, yet strong message that doing well in school really matters! At some point not too long ago, a piece along the lines of “see that silent mom who isn’t really participating while everyone else is talking about her child’s achievements” made the rounds on social media. It was a bit painful to read, because that mom is me. It’s not because I’m not proud of my son. I am. It’s because he doesn’t, at 17, always meet the generic measures of success for his age. He’s an average, not particularly motivated student. He’s not an athlete. And despite society’s allegedly growing recognition of kids’ different strengths and abilities, I don’t always see much evidence of a true shift in perception of what makes a child smart, or brag-worthy, beyond academic success and being good at sports. My own story couldn’t have been more different. I was a highly self-motivated student whose parents never had to remind me to do my homework or study. I had the grades to match, and my report cards were an enormous source of pride for my parents. I constantly overheard, and was told, that I was smart. 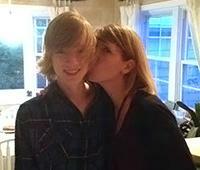 Where I sometimes struggled outside of the classroom, my son is socially capable in ways I wasn’t until I was much older. He’s quick-witted and well-spoken. He’s a fair and kind listener to his friends—I can see turning to him for insight and advice in the not-too-distant future. He is able to put voice to his feelings in a way many grown men cannot. He’s a talented, and largely self-taught, musician. And these are just a few of the things he is much smarter at than I was. Academic achievement is certainly worthy, and I don’t wish I had come of age differently; I’m proud to think back on my hard work, and I think kids who work hard in school do deserve to feel proud. But all kids, all people, have strengths that should be celebrated. My son is every bit as smart as I was—whatever may have been on our report cards. 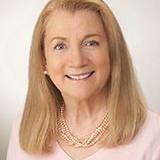 Elizabeth S. Leaver is a senior editor at School Family Media, SchoolFamily.com's parent company. She lives in the greater Boston area with her family. Classes in middle and upper school require students to take notes without assistance from the teacher. This is a difficult skill to master for many students, and it is not really taught anywhere in the curriculum. Those who normally use a computer for their homework must decide whether to use it for taking notes, as well. Notes have a purpose—to make sure students remember what they learned each day in class and to help review when time to take the test over the concepts. Here are some important things to consider when learning how to take meaningful notes. What works for one student when taking notes may not work for another. If your daughter is right-brained and creative, she might need a colorful, artistic way to take notes. Her notes may look more like doodling with lots of pictures. There may be very few words, yet her notes make sense to her and help her to remember things. She might use several colors of ink with each color having meaning (i.e. red for new vocabulary terms, and blue to mark something the teacher said is extra important). On the other hand, your son may need to concentrate on listening to the teacher rather than taking any notes at all. I would encourage him to use something like AudioNotes, so he can listen again later if he needs to. Leave some empty space on each page of notes. Either write on every other line, or leave the last two inches of each line blank. This space gives room to add more information from the textbook later when doing homework for that class. Each evening during homework time, review the notes taken that day. Highlight the key vocabulary or facts that were introduced. Make flashcards or use Quizlet to study these details before the test. Another strategy when revisiting notes is to make a web of related concepts. This helps make sure you understand how the topics relate to each other. We believe these connections help the brain to create strong memories. Taking good notes is a skill. All skills need to be practiced to become strong. Discuss some of these strategies with your son who is learning what kind of notes are going to work the best for him. Encourage him to think when writing or typing notes rather than to try to get the teacher’s lecture down word-for-word. Explain the importance of leaving some empty space on the page and show your daughter what she can do each night to make her notes more helpful. Taking good notes is one of the most important student skills to learn. With a little thought and practice, your son or daughter can be the student everyone else asks for copies of their notes!